Among distinguished company that included Joseph Losey, Francois Truffaut and Michelangelo Antonioni, Roman Polanski was a European Director that made three films in the UK during the British cinematic boom period of the 1960's. The first was the very sinister, but critically acclaimed, Repulsion (1965), which starred Catherine Deneuve who plays a repressed woman who retreats into a deranged world of her own. 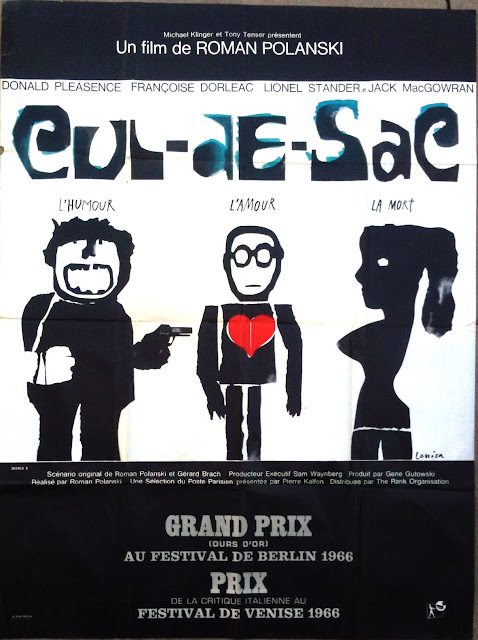 Because of the films success he was allowed to make the second of the three, Cul-de-Sac (1966), the third being the spoof Hammer film Dance of the Vampires (1967) which was said to be rather disappointing, although personally I have never seen it so I reserve my judgement for a latter date. Polanski did return to the UK to make a further films including the blood thirsty Macbeth in 1971. This followed the death of his then wife Sharon Tate who was murdered by the followers of Charles Manson in August 1969 along with four other people at the notorious 10050 Cielo Drive. Described as a psychological thriller, but more of a hilarious black comedy Cul-de-Sac is the story of two failed gangsters on the run after some botched skulduggery that's never explained. They end up on an Island that is cut off by the tide twice a day. Living on the island is George an effeminate ex businessman with a completely shaved head and a pair of steel rimmed classes that adds to his obvious neuroticism. Sharing the castle is his beautiful French wife Teresa. A bored, flirtatious young woman who has obviously not got a lot of time for her husband and you can't help thinking that she is quite pleased to have the company. That is until the situation deteriorates and thereafter begins a dangerous battle of nerves. ....with his flirty wife played by the tragic Francoise Dorleac. The script for this rather original movie was collaboration between the well known French born screenwriter Gerard Brach and Polanski. The title refers to the 'hole' that the two gangsters had got themselves into. It was originally planned to make the film in Eastern Europe but because of contractual details was made in Northumberland, England on Holy Island in Lindisfarne Castle. The Castle was an ideal location for this story with its coastal road that gets flooded twice a day and people can actually get stranded there. The script was adjusted to fit this setting and not staged as originally intended in a standard domestic house; incidentally furniture used in film was actually part of the Castle. 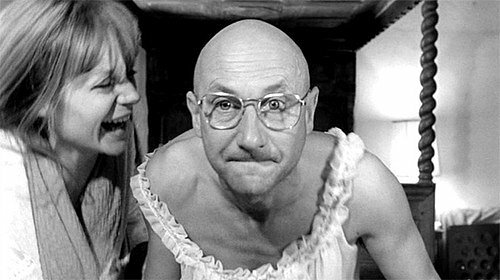 First cast was Donald Pleasence as the husband George. Pleasence was a problem with his constant mood swings and railing against the director requirements insisted on shaving his head every morning! Tests were carried out to cast Teresa; with lots of aspiring young actresses auditioning. The choice was wide, Polanski eventually settling on Catherine Deneuve sister Francoise Dorleac. In the scene where Dorleac has to swim in the sea, not only could she not swim but also following the second take she nearly froze to death! Iain Quarrier a social friend of Romans from the swinging London scene who was known to indulge in a little 'dope' plays "Christopher". The film also features William Franklyn, Robert Dorning and Jacqueline Bisset. 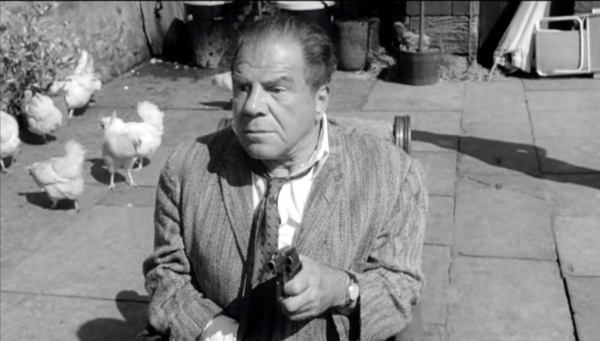 But the main problem Polanski had was casting the role of Dickey, the main gangster, eventually settling on the American ‘hard man’ Lionel Stander after seeing him on TV. But the American was not an easy man to work with, difficult, lazy and believed he knew it all, also he did not get on with Dorleac but at the time of filming he did have a heart problem that no one knew about on set! Casting the second gangster was a synch. Albi is played by Jack MacGowran who has been described by the director as ‘a dedicated actor’, a man with endless amounts of patience who nearly froze to death in one scene where the Morris Minor gets flooded and his wet suit leaked. It was without doubt a very difficult shoot, lack of money and therefore time, the weather was terrible having to contend with snow, sleet, hail and heavy rain and the tides was a problem never seemingly coming at the right time of the day. Roman Polanski is well known for working his actors extremely hard and the temperamental nature of some of the cast did not help. Towards the end of the shoot the situation was becoming critical, with pressure from producers on Polanski to get the movie finished as soon as possible. I don’t believe Cul-de-Sac was really meant to be a commercial film, made more to reflect Polanski’s taste in movies with an emphasis on atmosphere and character, but an original, rather enjoyable picture that does not look or feel like any other movie thanks largely to Polanski’s direction and Gilbert Taylor’s black and white cinematography. 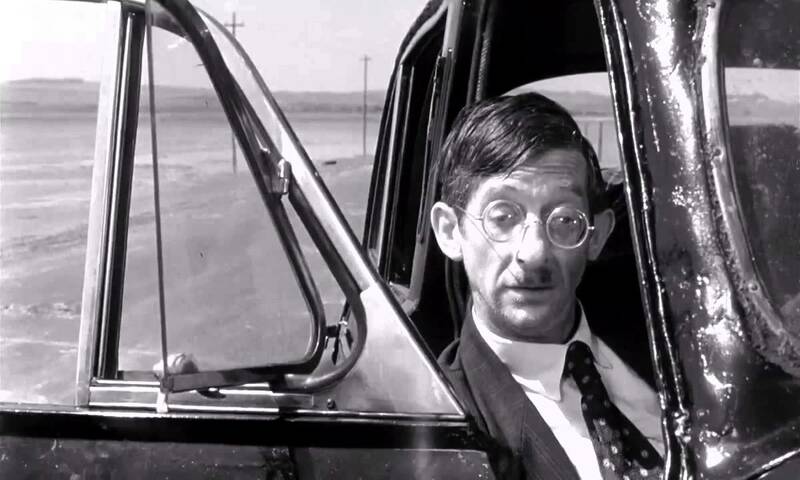 Dorleac was killed in a car accident on the 26th June 1967.